How Much is Xbox Live Worth? Try Over $1 Billion. How much is Xbox Live really worth? All it took was a little back of the envelope figuring for Bloomberg to come up with $1 billion in annual revenue for Microsoft's fiscal year, ending June 30. While Microsoft's been mum about revenue from its online entertainment service for the Xbox 360, Bloomberg simply multiplied the number of users Microsoft admits paid the annual Xbox Live fee--half of 25 million, or 12.5 million--by the $50 fee itself and came up with about $600 million. They then took Xbox chief operating officer Dennis Durkin's remark that sales of downloadable content topped subscription revenue for the first time--at least $600 million in additional dollars, that is--and landed at upwards of $1.2 billion total. Unless we're missing something in terms of how Microsoft calculates revenue, consider that a pretty reliable estimate, and one Bloomberg notes exceeds analysts expectations. It's also up from $800 million a year earlier, according to Goldman Sachs Group analyst Sarah Friar. So $1.2 billion, but how does that figure compare with revenue from other online content providers? Consider China, whose entire online games market was estimated at around $4.5 billion in 2009, with growth projected at 25 percent through 2010. How about the 800-pound Orc, i.e. World of Warcraft? 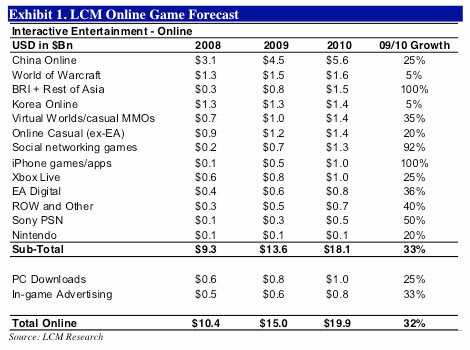 Blizzard pulled $1.3 billion in 2008, $1.5 billion in 2009, and Lazard Capital Markets analyst Colin Sebastian sees the massively multiplayer online fantasy game hitting $1.6 billion in 2010. PC downloads are projected to grow from $800 million in 2009 to $1 billion in 2010, while iPhone games and apps combined could go from $500 million to $1 billion over the same period. Total online market spend? Impossible to estimate accurately, but Sebastian puts it at around $15 billion in 2009, growing to nearly $20 billion in 2010. What about Sony and Nintendo? Sebastian's estimates put Sony at $300 million in 2009, growing to $500 million in 2010, while Nintendo limps behind with relatively stagnant year-on-year growth, wallowing in the $100 to $200 million range.